Born: October 31, 1735 in Sandwich Ma. Died: February 3, 1813 at 70 yrs. 1. Heman Swift; (Bef.1759 – 1797/1798); Married Patience/Patty Wing (Abt.1760 – ?) 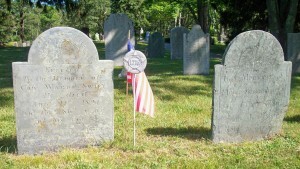 (David Wing, Rev War & Sarah Perry) in Sandwich Ma. on Bef.1779; Patience married (2) John Hallett, Capt. in Sandwich Ma. on April 13, 1806. 2. Elizabeth/Betsey Swift Barlow Freeman; (Abt.1760 – January 21, 1825); Married (1) Nathan Barlow, Capt. (1758 – 1795) (Thomas Barlow & Mehitable Wing) & married (2) John Freeman (1762 – 1828) (Seth Freeman & Experience Hatch) in Sandwich Ma. on December 4, 1796; Elizabeth/Betsey & Nathan are buried in Cataumet Cemetery. 3. Mary/Polly Swift Eldred; (Abt.1762 – January 19, 1839); Married Samuel Eldred, Capt. (1761 – 1847) (William Eldred & Rest/Rose Shiverick) in Falmouth Ma. 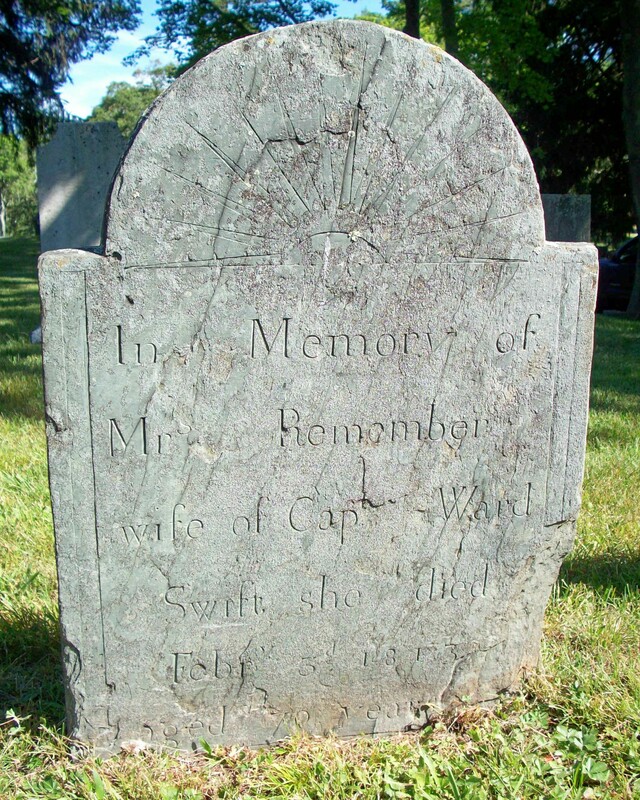 on October 25, 1791; Mary/Polly & Samuel are buried in North Falmouth Cemetery. 4. Samuel Swift; (1765 – November 7, 1842); Married (–) Perry; No further information; Samuel is buried in Cataumet Cemetery. 5. Moses Swift, Jr.; (1766 – March 31, 1846); Death date is October 1845 at 80 yrs. in Sandwich Vital Records; Married Rebecca Nye (1772 – 1851) (Samuel Nye, Jr., Rev War & Deborah Crowell) on January 6, 1791; They had 11 children; Moses, Jr. & Rebecca are buried in Cataumet Cemetery. 6. Ward Swift, Jr.; (1771 – November 12, 1805); Married Fear Nye, twin (1774 – 1853) (Samuel Nye, Jr., Rev War & Deborah Crowell) on January 13, 1799; Ward, Jr. & Fear are in Cataumet Cemetery. 7. Bathsheba Swift Crowell; (Abt.1773 – February 11, 1843); Married Joshua Crowell, Capt. (bp.May 17, 1767 – October 9, 1804) (Stephen Crowell & Hannah Nye) in Falmouth Ma. on January 28, 1796; Bathsheba & Joshua are buried in North Falmouth Cemetery. 8. Hannah Swift Bourne; (Abt.1775 – April 1, 1856); Married Charles Bourne (1775 – 1856) (Elisha Bourne & Joanna Nye) in int. 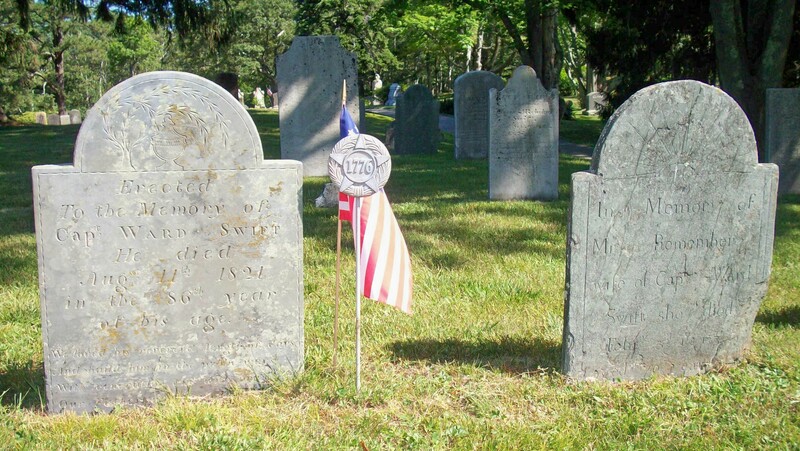 June 30, 1798; Hannah & Charles are buried in Sagamore Cemetery in Bourne Ma..